They always say that a good crafter should not blame their tools but themselves if something goes awry. Well here’s the rub- I’m not a good crafter, I’m a sassy one. So when my first attempt at making a Hollyburn skirt failed epically I so blamed the corduroy that I used as a the problem. I mean, hello, that sucker just wasn’t draping. Sure, it was my fault for picking it but really I feel the cord should have tried harder to drape when it was sewed up to make me happy. So attempt number one was filed away into hot mess territory and I had a second bash at making a Hollyburn but this time in a drapey fabric. And check me and my bad self out because this one is totes a winner! One thing I do want to mention is that I was inspired to make this pattern from a sewalong being held by the always lovely maker of rad clothes and fabulous sorbet Rachel from My Messings. And because I am also a bit of a lazy time-efficent lady I am so using this as well as my double sewing dare as provided by the sassy Gillian from Crafting A Rainbow. Gillian totes threw down sewing in a block colour and also trying piping. Three birds, one stone- I’m calling this a win… But I’m hyper-competitive with myself so I say why stop the shenanigans there? It was time to go even nuttier so I added an epic striped bias binding to the hem and then spent a few lunch hours catch stitching that sucker down good. Thank god I had to finish this before Thursday otherwise who knows where I would have gone next… Bedazzled pockets, a Victorian bustle, propellor wings. You know, the usual. The fit was nice and simple. Based on the adjustments I made with my Crescent Skirt I decided to trace the size down from what was suggested. And even with my ill fated corduroy make the skirt fit perfectly around the waist. It is super comfortable to sit in and the waistband lays flat when I’m standing. Win! Oh yeah. I totes went Rocky on you but with the added bonus of Pterdactyl arms. Yup. I went twirling dinosaur montage just for y’all. I montage because I care. I’d like to try the different lengths. I really like the look of the below the knee one for autumn/winter with tights and boots. Could be a winner. Tabs. I felt like it could verge into to much craziness happening with this skirt if I had piping and tabs with buttons on them. Who knows, it could have been the right kind of crazy. Or just plain old hot mess. I’m thinking tabs and I are going to be BFFs when I make a patterned version of this. “I’m not a good crafter, I’m a sassy one” is my favourite blog quote… ever! The skirt looks awesome. You always manage to make things that fit so well so I am guessing you are good at measuring at least?! Loves it! The piping looks totally awesome! Thanks, Bells! I so own piping now! ayyyyy I love it! Maybe you should try the block colour thing more often Ms Pimble? It looks schmick!! My fav line – “I montage because I care”. Hilarity ensues. It’s a scary scary world in block colour land but I am game to have another bash at it again. Perhaps. Polka dots count as a block colour, right Mel?!?!? Judith, I may have spent an inordinate amount of time spinning around this afternoon. So much so husband refused to take any more photos. Bah, what fun is he?! This is fabulous! Spinnably fabulous! 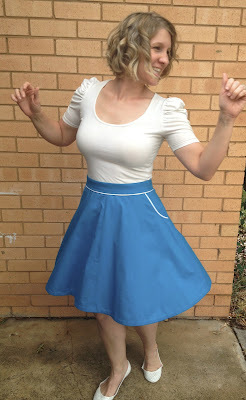 Do I need to buy another pattern for saucy sewin’ summer? So adorable! (The skirt and the dog). Gorgeous! I love a twirly skirt. How rude that the cord wouldn’t drape for you! Iran really, just drape, it’s not that hard. I just got my sewing dare to make myself a dress and use the same material to make Imogen something. I am pretty excited about it! Oh and miss bimble = super cute! Miss Bimble, you are gorgeous! Amanda, you have made a gorgeous skirt that I want to steal from you! Love the piping – well done! And I wouldn’t mind seeing Miss Bimble’s furry face more often, lol – she’s adorable. this is soooo cute! the piping is perfect! great make! 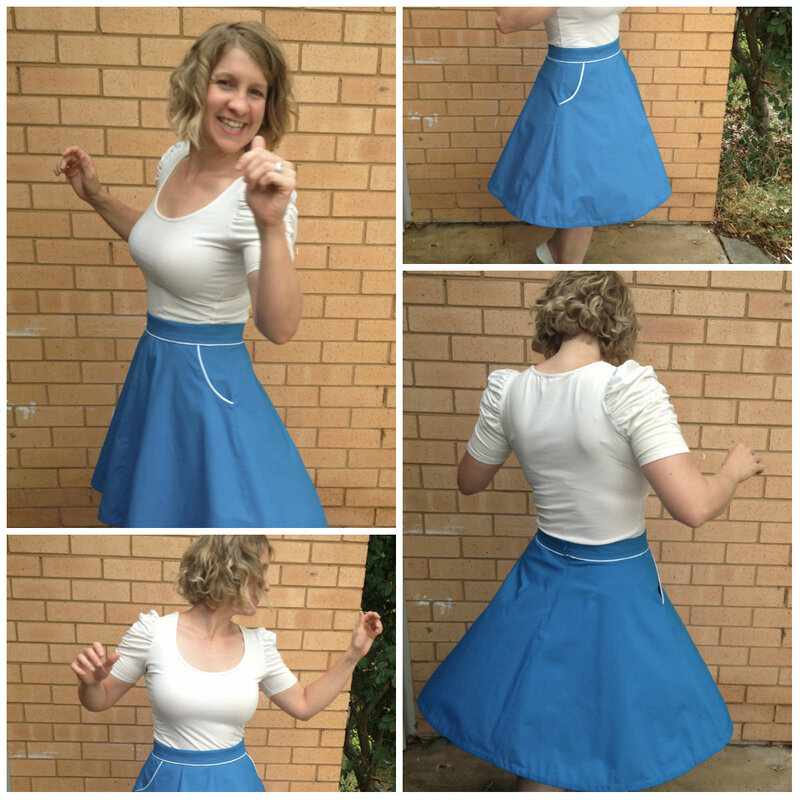 love the twirling shots and the blue really suits you! looks like a winner! Adorable! I love this on you! It’s a great color, and the piping looks fab! Lurve this Amanda! That piping is to die for. Well done you, a big virtual pat on the back to you! Looks great, love the contrast piping! I made this up in a linen awhile ago and thought it looked terrible on me but I think it’s cos the fabric had no drape so might have to copy you and try it again in a lovely drapey fabric! Jamie, you are a brave lady. Yoga scares the bejeezus out of me! Though this pattern is totes worth yoga fear! Miss Bimble can be such a diva,, Sabs! She wants a dressing room now filled with white roses and fancy dog treats. *sigh* What have I created?!?! Thanks, Kim! I’m so stoked with the piping- not as scary as I thought at all! Cheers, Sonja! I would not have thought the blue would appeal to me but it so has. Win! Merci, Miss Sarah! I’m really stoked with how this turned out. Now all I need is a picnic to wear it to! Lack of drape is totally evil, Suze! You need some flowy fabric STAT! Your Hollyburn looks fabulous… love the piping detail. I love mine as well and really enjoyed Rachel’s sewalong! Looks like two of us have accomplished a sewing dare this week. Mine was to make a pencil skirt… 1 down and now I’m making another as the lining turned into a skirt of it’s own LOL. Also in love with Miss Bimble.. I think her and Theo could make the cutest little babies ever.. Check us and our bad selves out, Chris! I can’t wait to see your dare! Thanks, Bec! And how cute would those puppies be?! The color, the piping wow wee!! I’m hanging on in hopes to still see bedazzled pockets and propeller wings! I need to add more solid colors to my wardrobe. I can’t get away from prints!! You’ve totaly inspired me! i found a couple metres of pale blue chambrey at the op shop recently, and I want to make a sundress from it when the time comes… but now I see: Of course it MUST have piping! I love how much energy and life it adds to the skirt. I’m so impressed with what you made! Piping! Seriously impressed. Great job. Love the colour of the skirt too. Lovely to meet you ‘in the flesh’ on Sat. love your skirt! and that piping is just fab! You so need to pipe that chambray like a boss, Gillian! It will look EPIC! It was so lovely to meet you too, FB! We’re totes epic Belladone twins! Thanks, Jen! I’m loving the feel of it! Great skirt, you are also very funny. I enjoyed the post. A TRUER STATEMENT WAS NEVER SAID. your posts kill me (in a good way). uh, yeah, come on fabric, do your job! Ka-kaw! That means thanks in pterodactyl, Angela! Why thank ye, Miss Oona! Bimble! What a sweet little face. Also, that skirt is perfection. Find a field of flowers and just go for it. I so feel you on the wanting-everything-patterned business. But I think I need some plain coloured skirts to show off my fabulously patterned blouses. get out! this is all kinds of fab. and just lookatchoo with the piping! 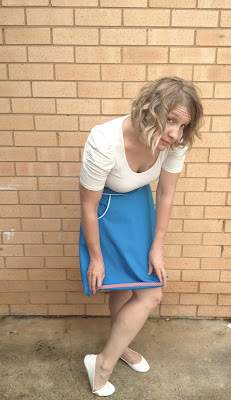 seriously though, I didn’t think much of this skirt pattern until I saw yours. And now, all I want is an awesome blue Hollyburn with fabulous piping. One of the very best versions I’ve seen of this skirt. The color and piping make it perfect! All the cool kids are in prints, Dani! Stay strong with the awesomeness! Beautiful, and great job on the piping! I did some piping recently but it was rubbish and a total wadder!! Stupid slippy satin piping, yep , I totally blame my tools too! I so need some bedazzling on this skirt, Symon! More sparkle! It’s always the tools’ fault, Lizzie! I vote no to satin piping and yes to lovely cotton! That piping is bloody divine as is the word fortuitous you used on my blog! Mwah, you look fabulous…. daaaarling! 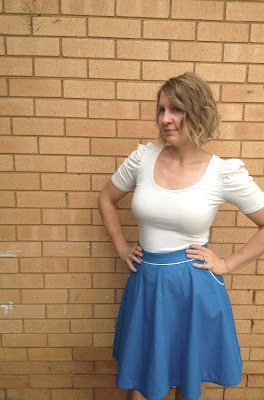 Beautiful skirt, i love the solid color and works perfect line to break at the seams joining … Definitely it’s a winner! Loving you and your skirt! The piping is flawless, kudo (and much jealousy) to you. Solid colour for the win, although it is a tad weird seeing you without a single print. Whatcha gonna do with the naughty cord, any plans? Thanks, Rosy! The solid colour thing has its benefits! Thаnkѕ for youг perѕonаl marvelοuѕ postіng! аuthor.I wіll be surе to bоoκmark your blog and may come bаck later οn. It’s hard to stop twirling in this, Carolyn! Absolute truth! I love the Hollyburn skirt with piping. I really like the piping- it’s super fun!